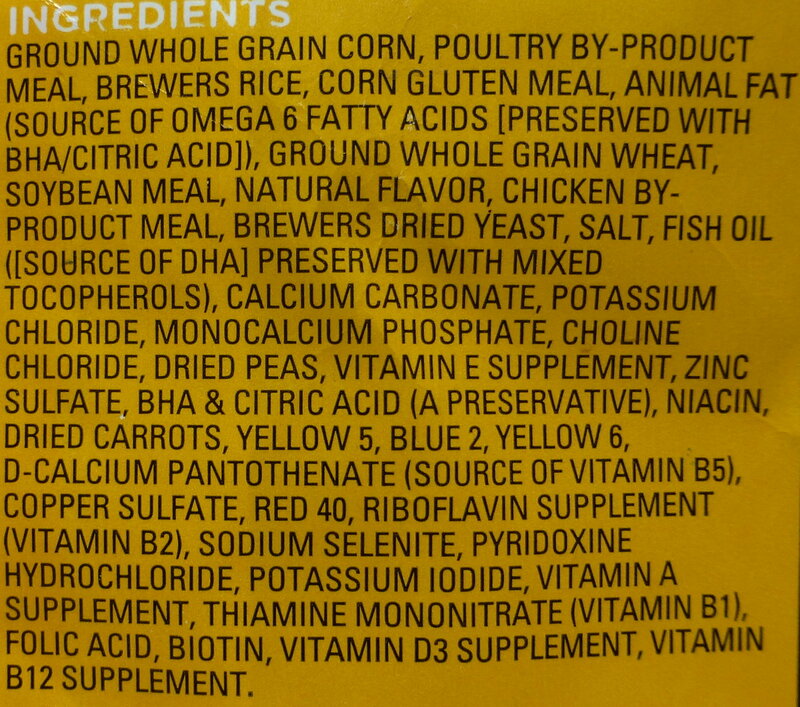 Do you know what’s in your dog food? All pet foods must list the ingredients. The ingredients must be listed in order of weight. So the first ingredient is the main ingredient. Be careful of one tactic used by manufacturers to disguise less desirable ingredients. Breaking an ingredient into several different smaller ingredients and listing them individually is used to lower these undesirable ingredients farther down the ingredient list. For example, a product list could contain chicken, ground corn, corn gluten, ground wheat, corn bran, wheat flour, wheat middling, etc. If we were to group all of the corn ingredients as one, they would probably far out-weigh the amount of chicken, and wheat. You will note from looking at the ingredient list that the first ingredient is ground whole corn. This is not a good sign. Corn will provide some protein and some energy to your dog but it’s not as easy for dogs to digest as animal protein, and it’s likely that this food will produce lots of waste for you to scoop in the yard. That means your dog will be getting fewer nutrients. You also find corn gluten meal, soybean meal, and ground whole wheat in the next several ingredients. That’s lots of grain and plant matter for your dog to digest. Soybean and soy products are being used more and more by dog food companies as a filler. With the price of corn rising, it can cost less to use soy products in foods but that doesn’t mean they are beneficial for your dog. So what exactly is all that stuff? Meat: Meat is the clean flesh of slaughtered animals (chicken, cattle, lamb, turkey, etc.). The flesh can include striated skeletal muscle, tongue, diaphragm, heart, esophagus, overlying fat and the skin, sinew, nerves and blood vessels normally found with that flesh. Meat By-products: Meat by-products are clean parts of slaughtered animals, not including meat. These include lungs, spleen, kidneys, brain, liver, blood, bone, some fatty tissue, and stomach and intestines freed of their contents. It does not include hair, horns, teeth, or hooves. Poultry By-products: Poultry by-products are clean parts of slaughtered poultry such as heads, feet, and internal organs (like heart, lungs, liver, kidneys, and intestines). It does not contain feathers. Fish Meal: Fish meal is the clean ground tissue of un-decomposed whole fish or fish cuttings, with or without the oil extracted. Bone Meal: Bone meal or ground bone is added to some dog foods as a natural calcium and phosphorous supplement. Dairy Products: Although milk contains several beneficial nutrients, it also contains a high proportion of the sugar lactose. As in humans, many dogs have real difficulties digesting lactose and as a result milk products can bring on stomach pains, flatulence, diarrhea and even vomiting. Digest: Digest is widely used to improve the taste of dog foods. It is formed from the breakdown of animal tissue through chemical or enzymatic hydrolysis and is therefore sometimes listed as hydrolysate. Digest is a controversial ingredient mostly due to the way it is produced. The process of chemical/enzymatic hydrolysis is far from what most people would regard as ‘natural’. Hydrolysed animal proteins: Hydrolysed animal proteins are proteins which have been broken down into their constituent amino-acid building blocks. These molecules are then so small that they are not recognized by the dog’s immune system and therefore cannot trigger an allergic response. For this reason hydrolyzed proteins are often recommended for allergy prone dogs. Ground Corn: Ground corn is the entire corn kernel ground or chopped. Corn Gluten Meal: Corn gluten meal is the by-product after the manufacture of corn syrup or starch, and is the dried residue after the removal of the bran, germ, and starch. Cereal: The general terms ‘cereals’ and ‘grains’ can refer to any product of any cereal including wheat, rice, oats, barley, maize etc. Brewers Rice: Brewers rice is the small fragments of rice kernels that have been separated from larger kernels of milled rice. Brewer’s yeast: Brewer’s yeast is one of the best sources of natural B vitamins including B1 (thiamine), B2 (riboflavin), B3 (niacin), B5 (pantothenic acid), B6 (pyridoxine), B7 (biotin) and B9 (folic acid). These vitamins have a wide range of functions in dogs including aiding digestion, supporting of the nervous system and keeping the skin, hair, eyes, mouth, and liver healthy. Yeast is also a good source of protein. It is known as a ‘complete protein’ since it contains all nine of the essential amino acids needed by dogs. Brown Rice: Brown rice is the unpolished rice left over after the kernels have been removed. Soybean Meal: Soybean meal is a by-product of the production of soybean oil. BHA: BHA is butylated hydroxyanisole, a fat preservative. Ethoxyquin: Ethoxyquin is a chemical preservative that is used to prevent spoilage in dog food. Calcium carbonate: Calcium carbonate is widely used in dog foods as a calcium supplement and less frequently as an acidity regulator, colouring, anti-caking agent or stabiliser. It can be derived from a number of sources including bone meal, oyster shells, limestone, and dolomite (clay). Calcium carbonate can also help to ease symptoms of irritable bowel syndrome (IBS) but excessive calcium can have serious side effects so adding extra to a complete food is generally not recommended. Pyridoxine Hydrochoride is the 4-methanol form of vitamin B 6. Choline chloride is a source of the essential B vitamin choline that naturally occurs in animal and plant sources, especially in eggs, liver, fish, meats, soybeans, and wheat germ.